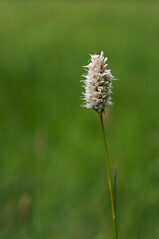 Thank you Wayne Weber (Wayne Weber@Flickr) for today’s photo of Bistorta bistortoides. Bistorta bistortoides is commonly known as American bistort, western bistort, smokeweed, mountain meadow knotweed or dirty socks (a reference to the “fragrance” of the flowers). 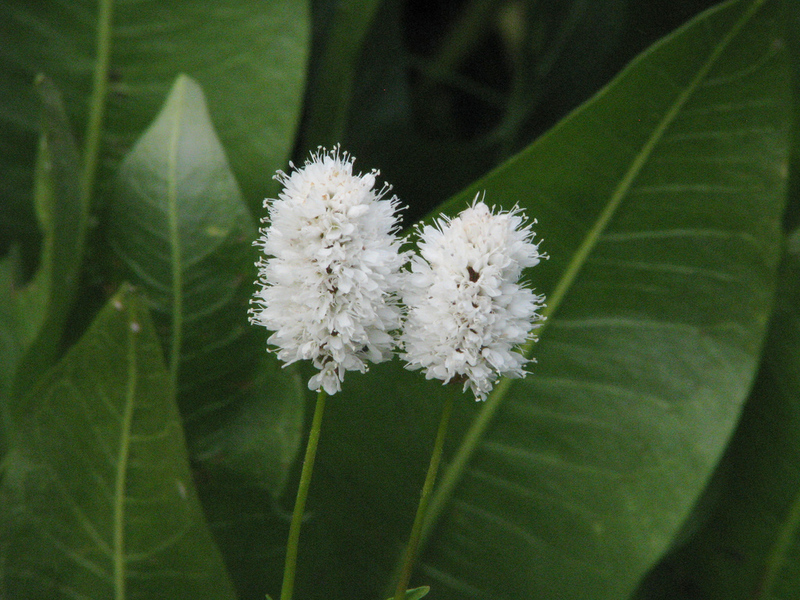 Scientifically, it is also known by these synonyms: Polygonum bistortoides and Persicaria bistortoides. This perennial species ranges in height from 0.1m to 0.75m, although plants will tend to be shorter if they are growing at higher elevations within their range (1300m-3800 m). Bistorta bistortoides is native to western North America and is distributed from British Columbia, south to California, and eastwards into Alberta and the central United States (Montana, Wyoming, Colorado, and New Mexico). The Jepson eFlora lists Bistorta bistortoides as being present in “wet meadows, streambanks and alpine slopes”. Bistorta bistortoides blooms relatively soon after snowmelt and fruits later in the summer. Although no uses are listed by the USDA, the Flora of North America (linked above) provides some traditional native uses: the “roots of western bistort were used in soups and stews by the Blackfoot, [and] boiled with meat by the Cherokee, and used in a poultice that was applied to sores and boils by the Miwok (D. E. Moerman 1998)”. Wikipedia also notes that Bistorta bistortoides is “edible either raw or fire-roasted with a flavor resembling chestnuts. The seeds can be dried and ground into flour and used to make bread. They were also roasted and eaten as a cracked grain”. pathology — I have never seen this plant before and even though it is, at least partly, edible I have never seen it as plant or as seed, offered in any of our normal Garden Centers or Native California Plant organizations. And now that I am Retired/Disabled it may be too late! But on the serious side, Thank you Very Much for this Parting Shot from my old profession! Ha Morris…. It is pretty but you probably are better off not having it in the garden center because it smells really bad and really strong. I’ve been growing this (bought as Persicaria bistorta) for years at the edge of my bog garden here in Ohio. I’ve aways enjoyed it and never noticed a bad fragrance. Nice to know more about a plant that is such a nice, and well behaved, feature in my garden. I saw this species growing in Wawona Meadows in the southern part of Yosemite National Park. From a distance it looked like a field full of cotton balls on slender sticks. Marika – that’s not as bad as the common name for one of the most prolific wildflowers in and around San Francisco – Bluedicks – Dichelostemma capitatum. That always gets a round of snickers. I’ve heard some naturalists use “California Hyacinth” just to avoid the giggle interruption. How could the Cherokee have been able to use this western plant, since they were a southeastern group? I traced this apparent error to eFloras.org, but it may come from their reference (D. E. Moerman, 1998). Great observation, Burt. I wonder if this is one of those instances where changing scientific names and/or segregating species meant information became wrongly assigned. Pojar & MacKinnon give the common name dirty socks to alpine buckwheat _Eriogonum pyrolifolium_. That plant I’ve seen at Long’s Pass at the eastern side of the Cascades, in Esmeralda Basin. They say of its ecology: dry scree, talus and rocky ridges, most common on pumice; at high elevations.